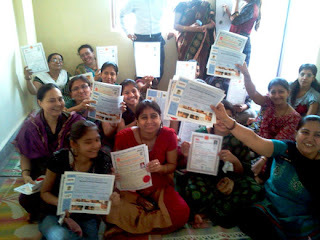 PRAGATEE FOUNDATION AND AADHAR SKILL DEVELOPMENT TRUST has been successfully started women skill development program in various parts of Mumbai. Originally it is concept of AADHAR SKILL DEVELOPMENT TRUST. Under this Scheme AADHAR SKILL DEVELOPMENT TRUST working for its Gujrathi Bhanushali communities has been selected and nominated group of women for skill development program to PRAGATEE FOUNDATION, MUMBAI. Pragatee foundation make an arrangement of training IT LITERACY PROGRAM & TYPING SKILL DEVELOPMENT PROGRAM in its authorized training center. Successful student will honored by two certificates one from Pragatee Foundation and another from NASSCOM FOUNDATION. Student will get Micro soft unlimited potential (MSUP) certification along with computer Tally accounting knowledge. Under Typing Skill development Program every successful student will get certificate from PACE (POONA). It is absolutely free of cost training program for enrolled students. Only nominal registration amount is charged by Aadhar development trust from candidate. Pragatee foundation manages all Training Schedule, Batches Schedule, Exam Schedule and Certificate distribution Schedule. Pragatee foundation also arranges JOB FAIRS and Placement Assistance to successful candidates. It is very useful program for house wife who wants to become a self-earner.